The rooms and suites of the Noble house are comfortable, cosy and full of history: the roman wall, XVII century glazed tiles and vaulted ceilings are some of details that make each of the hotel rooms one of a kind. The décor, inspired in the Alentejo traditions, evokes a peaceful and warm environment and invites to a relaxed stay. Allow yourself to discover the house history and the Alentejo culture! The most excusive suite of The Noble House has in its background the old roman-gothic city wall. It is a unique suite where history, tranquillity and comfort are combined in a perfect symbiosis, thought to provide guests a memorable experience. In this suite there is a large living area, an ample bedroom and also a big private terrace where guests can rest and enjoy the warm Alentejo sunsets. Large, bright and very private, the Noble Suites are around 30m2 and have views of the Alentejo plains or the city Cathedral towers. These suites have a harmonious living room and a bedroom, where the earth tons predominate in a chromatic spectre that gives an elegant timeless felling, becoming therefore the perfect setting to relax and plan your visits. With areas that go from 27 to 30m2, The Noble House suites are spacious and comfortable, with living and sleeping areas decorated in smooth tons and with different textures that evoke the Alentejo landscape that frames the Hotel. Each of the Noble Rooms has its own unique characteristics that reflect the old Manor House living. From XVII century glazed tiles panels, to balconies or private patios, each one of the rooms shows a different characteristic. A warm and contemporaneous décor and a perfect colour choice that reflects the light and provides a sense of harmony and serenity, invite guests to a relaxing and peaceful time. With areas from 16 to 20m2 and very pleasant and picturesque views of the outdoors, the Prestige Rooms are perfect for a calm and relaxing stay full of comfort and tranquillity. 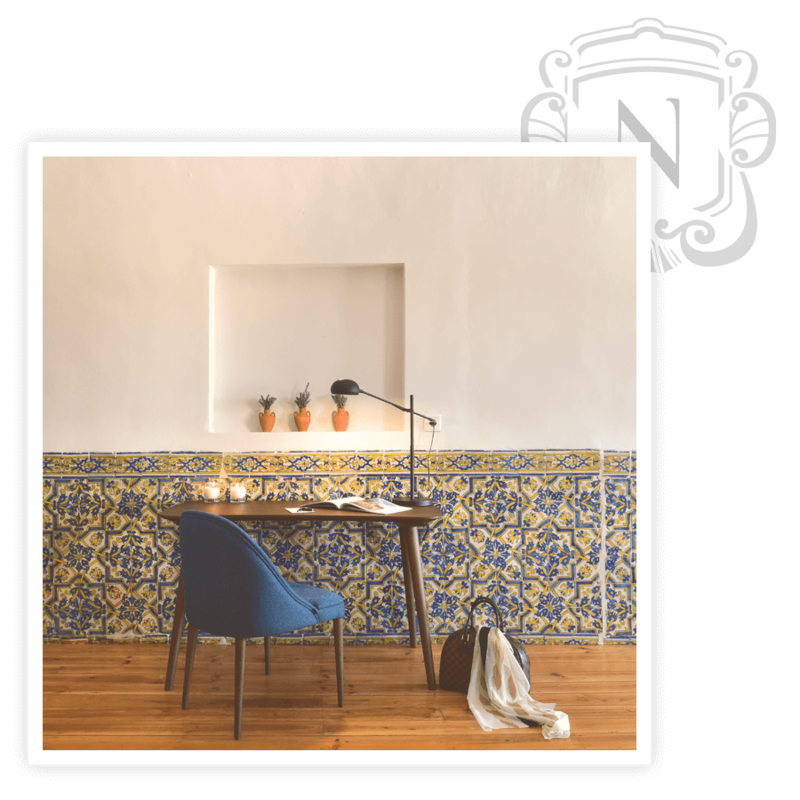 The décor, inspired in the Alentejo traditions, has a modern and nature twist and simultaneously great comfort and warmth. Classic and timeless, the Classic Rooms are the perfect choice for a unique stay in the city, that can be seen from their windows. The décor has been inspired in the Alentejo natural tons in a perfect combination of nature and history. The reception is available to receive and help you at any time of the day. An amazing breakfast with the best region products, is served everyday at a chamber with a dome in clay brick and a pleasant balcony. Start your day with the famous Alentejo bread and the best cheese , sausages and jams from Alentejo. The typical conventual sweets is also not forgoten. Placed on primitive kitchen from XVII century, the bar space holds poyals, the sink and the original chimneys, as well as the flooring tile seventeenth century. Its historical environment, but chilled, its the perfect place to taste regional glass of wine, a refreshment or a cocktail.